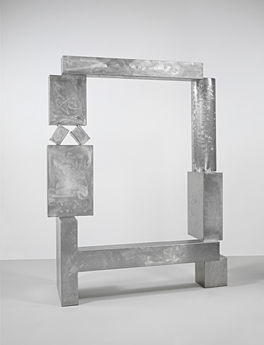 ABOVE: David Smith, Cubi XXVII, 1965. Stainless steel, 111 3/8 x 87 3/4 x 34 inches. Solomon R. Guggenheim Museum, New York, By exchange, 1967. Photo David Heald © 2006 The Estate of David Smith/Licensed by VAGA, New York. Smith’s interest in monumentality and outdoor sculpture culminated in his final series, the Cubis, which he began in 1961 but did not turn to in earnest until 1963. For these works Smith broke with several hallmarks of his career to date, eschewing both thin linear forms and junkyard materials in favor of prefabricated, highly polished cubic, cylindrical, and rectangular elements. Nevertheless the Cubis synthesize many formal concerns from throughout Smith’s career, exploring verticality to a new degree, simulating pictorial frames around open space, and articulating a delicate balance of masses. These sculptures’ regular, repeated forms foreshadowed the pure geometries of Minimalism, but Smith’s expressive style of construction, with its ultimate source in Cubism, continued to dominate. Smith intended the Cubis to be displayed outdoors, and for this reason he chose to construct them in stainless steel, which he burnished to achieve maximum reflectivity. He had employed this process as early as 1957 in a number of works constructed from flat panels and thin rods; the burnishing achieved much the same ends as the overt brushstrokes Smith painted on many sculptures of the period. Used in concert with the three-dimensional elements of the Cubis, the burnished surfaces took on a new level of importance, absorbing the light and color of their surroundings in the round, and establishing an entirely new way of engaging with sculptural space. Smith continued to develop his Cubis up until his death in 1965, and in the ensuing years they have become emblematic of his varied achievements in the field of 20th-century sculpture.